Because all of the surfaces you want disinfected don’t fit in a jar, we created Barbicide spray! 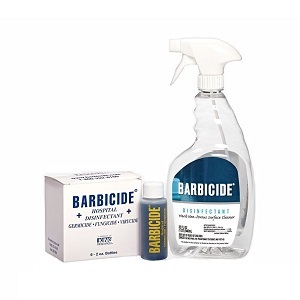 Your countertops, shampoo bowls and chairs will meet your standards for sanitation and disinfection when you use Barbicide spray! Sold as a sprayer bottle with 6 (2oz) refills, this is the most economical way to achieve superior disinfection in the salon, spa and barbershop! Hospital-grade, EPA approved broad-spectrum disinfectant in pre-measured concentrate with manufacturers labeled sprayer bottle. Disinfect and touch-up any time! Includes FREE empty spray bottle!